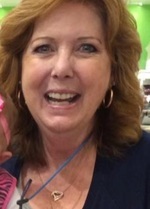 Deborah Lee Rothwell, 64, of Leesburg passed away on Wednesday, April 10, 2019. Deborah was born in Germany in the Army Hospital and was a Christian. She was raised and attended school in Louisville, KY. She worked in the General Electrical Plant in Louisville, KY. She moved to Leesburg, FL in 2000. She enjoyed gardening and her dog, Baby. She is survived by her loving husband, Sonny Rothwell; step daughters, Bridget (Jason) Exum of Ocala and Adrienne (Nick) Barbier of Belleview; three grandchildren, Alexis Sullivan and Brody and Adley Barbier; sister-in-law, Doelene (Brad) Brown of The Villages; niece, Lori Strong (Jamie) Ricketson of Weirsdale and nephew, Brian (Camille) Lingerfelt of Ft. Walton Beach. To send flowers to the family of Deborah Lee "Debbie" Rothwell, please visit our Heartfelt Sympathies Store.